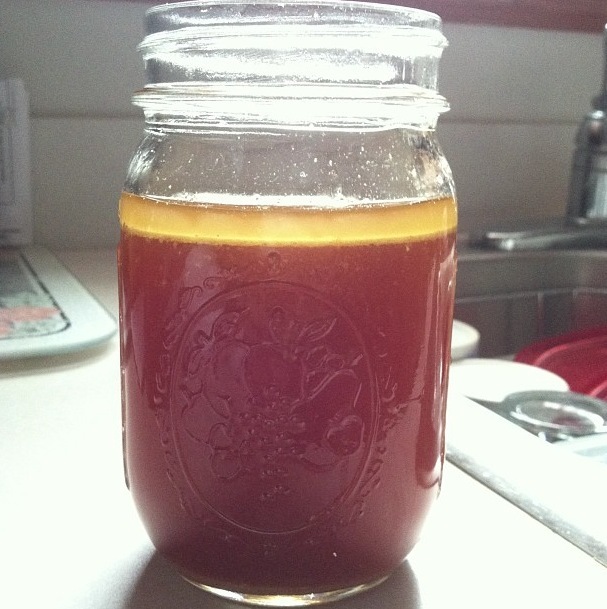 The one thing about the Paleo diet that scared me the most was bone broth. Having been eating 95% Paleo for the past 3 months, I decided a few weeks back that I was going to attempt to make bone broth. I had a general idea of what needed to be done to do so, but I did a little research first to make sure my general idea was even correct. It turned out to be fairly accurate, but I decided to use a crockpot to cook the chicken and make the bone broth. I used a whole chicken in a medium sized crock pot and covered it in distilled water. Added half of an onion and half of a bag of baby carrots to the water and covered the chicken in minced onion. Cooked the chicken on high heat for about 1 hour in the crock pot and then another 4-5 hours on low heat. Once chicken is finished cooking, you can tell by the smell, turn off crock pot and remove chicken. 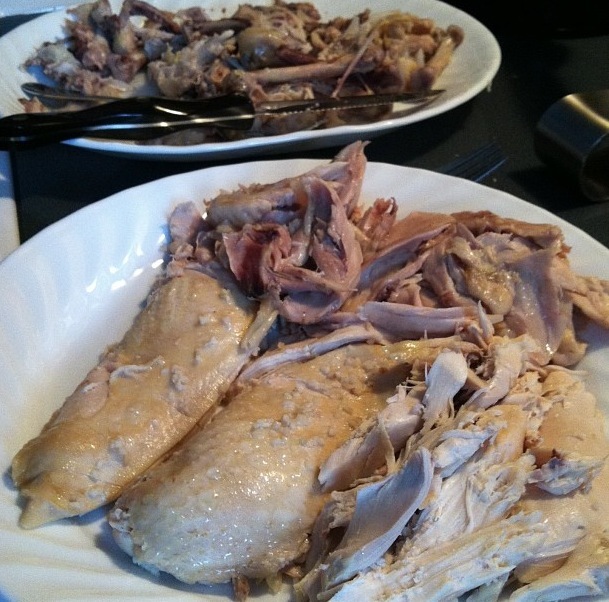 Remove all meat from bones and cartilidge and replace the carcass back into crock pot. Add 2 Tbsp apple cider vinegar and enough distilled water to make sure the carcass is covered to simmer. Fish out majority of carrots and onion, turn back to low heat, cover and let cook for another 24 hours. 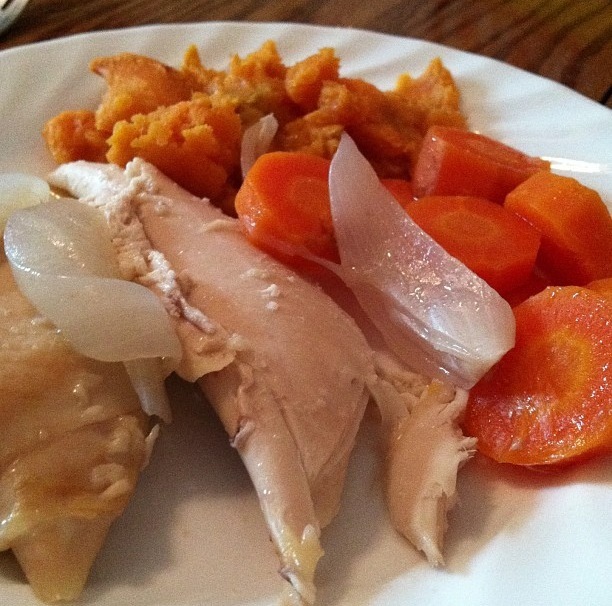 I decided to serve up the chicken with some of the veggies that it was cooked with and a side of mashed sweet potato. The next day, 24 hours after replacing the chicken carcass into the crock pot, I strained the contents of the crock pot into two mason jars. Make sure the veggies are all picked out. I ended up drinking an entire jar’s worth that evening. All it needed was a little pepper and a dash of salt added to it in a mug and it was absolutely fantastic. 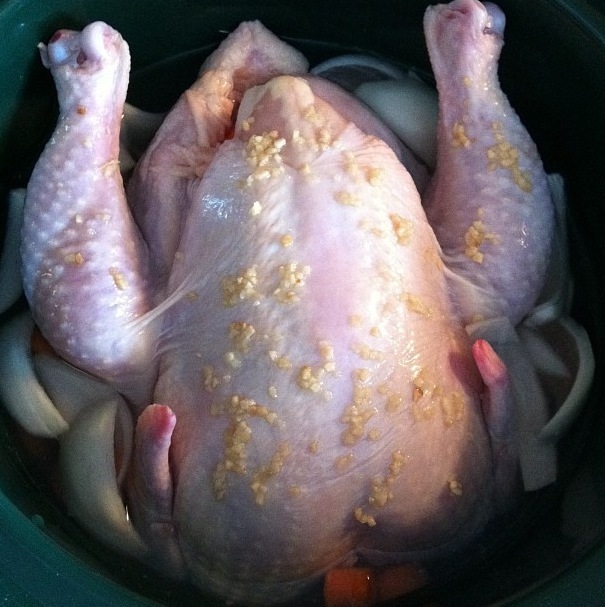 To continue the process, after straining the bones and making sure all of the veggies are removed, return to crock pot. Cover with more distilled water, 2 Tbsp apple cider vinegar, and another half of an onion cut up into large pieces. Add in desired spices and let simmer for another 24 hours. Repeat process again if desired. Happy Cooking! Please comment with any questions!